I am fasting right now, so my energy level wanes during the day, but I needed to lose a good 15 pounds. (Actually more like 18, but I was giving myself some slack.) I did not work in a cleansing water fast in January as I normally try to do. That in part was due to the fact that as I have gotten older, I tend to get leg cramps at night in the winter, even though magnesium supplements help. I also tend to get leg cramps when I fast. The idea of doubling up this cramping challenge in January was not something I was excited about doing at the time. I decided to do a milk fast, which means I drink about 2 ounces of raw whole milk with 2 ounces of water in the morning and in the evening. I also have been eating about 2 ounces of yogurt in the afternoon. So, while my digestive system is not complete closed down, the milk keeps my metabolism on a high level spurring my body to burn off fat stores faster. I am about half way to my weight goal. The months that followed January were still too cold and just as I thought I might be able to give a fast a go, we were almost in April. The month of April...I can only describe it as Piano Month or maybe Crazy Piano Month! This year it turned out to be crazier than ever before. 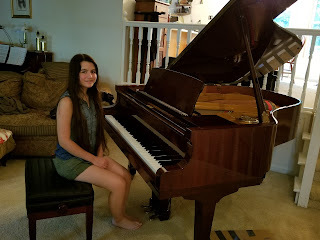 The Princess, who was not particularly interested in going to college and did not know what she wanted to do even if she did, suddenly decided that she wanted to go to college for piano. This same girl that begged me for a few years to quit, yet in the past year has blossomed in her skills and likes to take on challenges. First, the Princess had decided to do something new, to apply and submit an audition video for the Reinhardt Piano Festival. Despite she did everything as last minute as possible and it took 3 hours to load her 10 minute video to YouTube, which put it after the deadline, she was accepted. Second, there was the AG Georgia District Fine Arts Festival in which the Princess won first place last year. This year she did not place, but her score was high enough to be invited to the Nationals in Houston, Texas at the end of July. There was more competitors possibly because Nationals are closer and will not be as expensive to attend. Then she was to perform in the annual Spring Piano Recital that her piano teacher organizes. This year she played four pieces throughout the program and the final piano piece, which was a great grande finale kind of song. And my baby girl then turned 17 years old! So, after the birthdays, because my husband's follows hers, I decided to lose the extra weight I have been carrying for so long. It is amazing how a fast can also change my perspective about other things as well. I look around the house and think, this can go and that can go. I am in the process of selling off all our homeschool curriculum that has been sitting on shelves unused or that we finished (or quit) long ago. Time to streamline. This is her last year and I need to prepare for the next phase of her life and of mine. My Lord, thank you for giving my daughter such a wonderful gift and now the desire to use it. May she do so to glorify You. I think this is the hardest part of homeschooling. It has been so consuming fr so long & suddenly you are holding the short end of the stick. It does all work out but the travelling can be bumpy.